A leading-edge assessment solution works best when combined with leading-edge support, and we are proud to provide a full range of services to assist with your decision making and assessment needs. We have experience of supporting our clients in a variety of ways, including running workshops, undertaking centre engagement activities, and carrying out marketing campaigns. High-stakes assessment delivery is pivotal to your business, so you need to trust your partner. You may need support, training, and guidance to make the most of Surpass as part of a wider business operation. You know your market, but a little extra assessment technology and industry knowledge can make a significantly noticeable difference and expand your reach. Usability and good design are essential for creating the best experience for both your authoring team and your candidates. Training support ranges from a comprehensive collection of online help and knowledge, through to bespoke face-to-face product training. 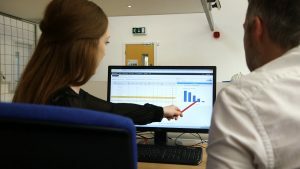 Customers and users have access to updates, best practice guides and information delivered through a rich media portal offering video and software simulations alongside printable documentation. In addition, our Documentation and Training Team are continuously updating these materials and enhancing our available resources. Additional training can always be requested, and we’re happy to train on location if this better suits your organisation. Face-to-face training ensures any initial questions are answered efficiently. Our support desk is available to customers to deal with technical requests or general product help and advice. We also offer an option to train your existing support staff to deal with Surpass Platform enquiries; a popular choice with some larger clients. Dedicated Service Delivery Managers are available should they be required for the smooth operation of your high-stakes assessment process. We have a huge amount of experience in the learning and assessment sector, and work closely with our partners and clients, implementing and monitoring changes and improvements. We’re happy to assist with developing bespoke assessment solutions for your individual needs, or work with partner educational specialists to provide you technology and industry knowledge. In house capabilities for developing bespoke solutions, tailored to your needs. The Test Centre Network is a global collection of approved examination facilities that allow you to deliver your exams with the confidence you would have in your local centres. BTL approved global test centres are regularly audited to ensure not only security, but that the comfort of your students is prioritised, ensuring that they perform to the best of their ability. A Global network of high quality professional testing locations. High quality examination facilities to support session based assessments. Audited centres to ensure quality of delivery remains consistently high. Professional and trained staff to perform security checks, and assessment invigilation and proctoring. Secure, comfortable, and modern locations ensuring the candidate remain focused throughout the assessment. A B2B managed service ensuring your assessment cycle runs smoothly. Get your content into Surpass with the support of our team of Surpass Experts. Are you short on time and resource, or don’t have the in-house assessment design expertise but want to transfer your existing content into Surpass? The Test Conversion Service can support you with this. Whether you’re currently delivering on paper and want to transfer content to on-screen, are transitioning from another system, or just need some extra support with item or test creation, we can help. With flexible levels of service to suit your needs, our team of Surpass experts are on-hand to help when you need it most. Support is available for one-off conversions of content to get you up and running, or long-term arrangements can be made should you require an ongoing service. What are the benefits of using the Test Conversion Service? If you would like any further information or think the Test Conversion Service could suit your requirements, please contact your BTL Account Manager. All Surpass users are encouraged to use our “Uservoice” feedback process to suggest changes as part of a community contribution to the product roadmap. We also understand that not every ‘off-the-shelf’ solution is a perfect fit, and in this scenario we can work with you to undertake professional bespoke development. Engaging in technological developments and implementation can be a complex exercise, but our PRINCE2 qualified project management team are here to support you through that process. We will work with you to use the right project controls and processes for the undertaking. If you know what you want, but you are worried about where to start, our implementation specialists are on hand to ensure the integration of your current systems goes as smoothly as possible. Our in-house Quality Assurance Team provide a holistic testing approach to improvements made to the Surpass system, and features a number of ISEB/ISQTB qualified technicians. Also, because BTL are ISO 9001:2008 accredited you can rest assured that we have the best Quality Management Systems in place. With expertise in the team ranging across User Interface, Fine Detail, and Graphic Design for Print & Screen, we not only ensure that Surpass is the best looking tool out there, but that it’s the most convenient to use, and that we can help to integrate your company’s values and branding into your assessment solutions. It is often the case that making the decision to buy/license an existing assessment platform or build your own often comes down to how your requirements differ from market trends. Surpass is a customer-driven product, and our roadmap is influenced by the needs of the market, but these don’t always match all the needs of our customer base. BTL have therefore implemented a Sponsored Development Team model which is successfully proven to provide customers and partners who have development resource, the ability to build features which bring value to their market and business growth. Because we operate an agile approach to development, additional teams sponsored by our customers and partners can create features within Surpass, giving you the option to build what matters to you on top of an already excellent product. It’s better than an Open Source approach, because all development is supported and quality checked by professionals, therefore everyone benefits without the uncontrollable risks of open source development. If you have further questions regarding BTL services and assessment tools then please get in touch.